I live for experiencing the unique and unexpected of Des Moines. A pop-up “Dîner en Blanc” picnic along the riverwalk, talking to bonobos, a marshmallow that cured my fear of beets (thank you Proof) to a high jump competition in the middle of a produce section. Yes, Drake Relays are almost upon us and below are my must-see, and most talked about favs! Fifty of the most adorable bulldogs you’ve ever seen vie for the title of Most Beautiful Bulldog. Awards for congeniality, best dressed and farthest from the dog house will also be given. My prediction: it’s a tossup between Sweet Sassy Molassy and Thor “Dog of Thunder” Flynn. Yes, you read that right. Drake and Hy-Vee are really thinking outside the box this year with the High Jump at HyVee—and I LOVE it. Why not have world champion athletes high jumping in the produce section?! So bring your camera and grab an apple nearby….this. will. be. AWESOME. The Grand Blue Mile is one of the Drake Relays Week staples. A race through the streets of downtown for all ages (and abilities). You can also watch by skywalk or sidewalk as Olympians and American record holders battle it out in the fastest 4 minutes of your life. Your heart will be pumping! You may get a workout by just watching. Grab a spot on the second-floor balcony of Jordan Creek Town Center and watch Olympic royalty battle it out at the Pole Vault in the Mall! Defending champ and 2012 Olympic silver medalist, Yarisley Silva, will take on the world’s No. 1 vaulter, Jenn Suhr. Be the one to start an epic slow clap. They’re bringing the London lineup to Des Moines -- 2012 London Olympic Games gold, silver, and bronze medalists will duke it out in the elite men’s 400m hurdles. If that med-tastic trio doesn’t do it for you, there are plenty of other rematches from the Moscow World Championships. If you had only one night to catch the action-Friday night would be it. Lights. Spikes. And lots of speed on iconic blue oval. 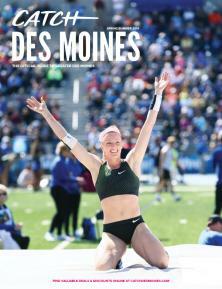 Nothing screams Iowa like the Drake Relays! See you there! !